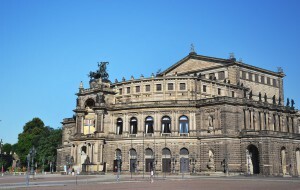 Selected performances by the Saxon State Opera Dresden. The Nutcracker and much, much more. bookable from 03.05. till 05.05.2019, 2 x overnight stay/breakfast, 4* hotel, opera ticket "Schwanensee"
Not every composition turns out to be an opera, but every visit to the Semper Opera in Dresden turns out to be into a special experience. Tickets for the Semper Opera are sold out? You can’t find a suitable hotel in Dresden? You also want to visit Dresden‘s Grünes Gewölbe (Green Vault)? Daily ticket contingents for the Semper Opera and Dresden State Operetta as well as excellent partnerships with selected hotels and other ticket services round off our overall concept and allow for last-minute bookings. We offer sought-after ticket for the Semper Opera and Dresden State Operetta, as well as exclusively concipated culture arrangements in Dresden. Our team of highly motivated agents bubbles over with ideas and turns every event and short stay in Dresden into a highlight. In addition, we offer a range of much sought-after opera performances, first-class opera tickets and hotels in the vicinity of the theatre. Make use of our 20 years of experience in tourism in Dresden and experience our individual, fast and straight-forward management of your culture tour package. We don’t only supply you with chosen Semper Opera tickets, but Compact Tours also offers a complex incoming service including a wealth of tourist services such as guided tours, transportation, restaurant bookings, boat trips on the River Elbe, rides in horse carriages and whatever else a tourist’s heart may desire. Do you want to see all highlights but also wish to explore some gems far off the main tourist routes? Maybe you would like to discover the fascinating surroundings of the Saxon capital? Our partner company offers a 22-stop city tour of Dresden that takes you to all the cultural sights of the city. Furthermore, you have the possibility to get off at individual stops to explore some of the sights in more detail. You can also book a nostalgic trabi tour through us. Our offers range from romantic boat trips and horse-carriage rides to the Dresden Card. Get to know the picturesque city of Dresden and enjoy an unforgettable break.